In 5-quart Dutch oven, heat oil over medium-high heat. Add onion; cook 3 to 4 minutes or until tender and starting to brown. Stir in garlic; cook about 30 seconds or until fragrant. Add water, salsa verde, green chiles, uncooked pasta and taco seasoning mix; heat to simmering. Reduce heat to medium-low; cook uncovered 13 to 18 minutes, stirring occasionally, until most of liquid has been absorbed. Stir in cream cheese and 3/4 cup of the shredded cheese until melted. Stir in chicken; cook 2 to 3 minutes, stirring constantly, until heated through. 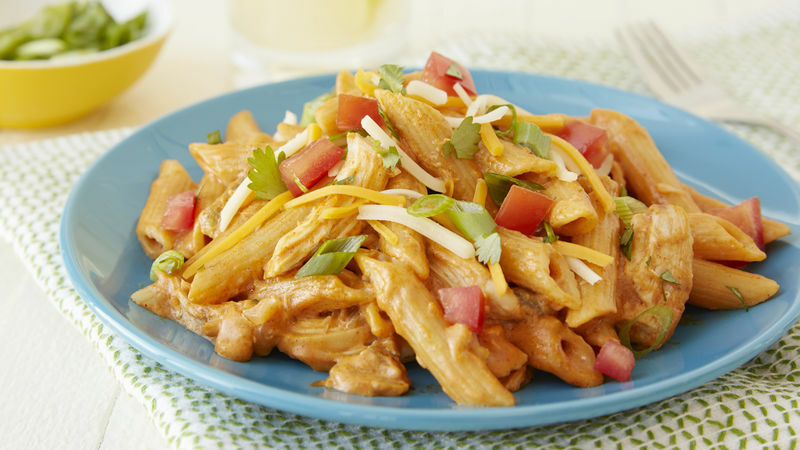 Top with remaining 1/4 cup shredded cheese, the cilantro, tomatoes and green onion before serving. Green salsa verde varies in heat level, so select a mild variety for a less spicy version. Leftover cooked chicken works great in this recipe, as does chopped deli rotisserie chicken.